You can place the tvm (Time Value of Money) function into a static library so that you can reuse the function. 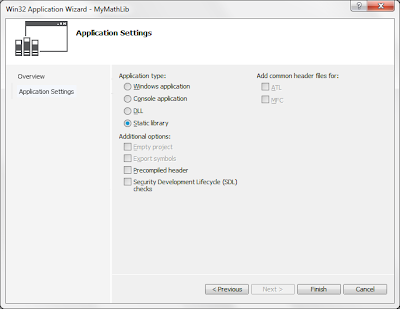 To create a static library, you need to place the function in mymath.c and create a separate header file mymath.h. You can create static library using the command ar. This command also allows you to add additions library functions. The naming convention of a library package must be prefix with lib follow by the name of the library and the file must end with .a. Therefore a typical library should be named as libmymath.a. Note: Please note that you can use #include "mymath.h" or #include "~/Documents/cprog/include/mymath.h", depending on where your header file is. -l option follow by library name indicate which static library to link, note that this option automatically add prefix lib and append .a, If you have more than one library file you must indicate it separately. Besides gcc and ar, you can also use ranlib. Ranlib is equivalent to the command ar -s. There is also another tool known as ld. This is the basic linker which usually runs behind the scene when you run gcc, use man ld to see default search path for static library. Another useful tool is nm. This tool display object files or library file. The command ar can also be use to display object file. Note: This is the better tools because besides object files it also list the function names. Do we need to create a library file? When you use the command ar to create a library file, it is basically an archive of many object files. A library file is useful for packaging and distribution purpose. As you create more and more object files, then it is easier to group all the similar object files into a single library file. It is easier to use library file to distribute to other software developers instead of multiple object files. 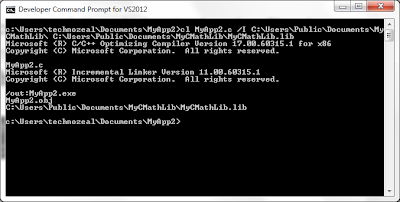 The following procedure is to create a C program with a dynamic link library using Developer Command Prompt for VS2012. The important difference between DLL and static library is that the code of external function is stored in the DLL file, whereas when linking with static library, the code of the external functions is copied to the execution file of the application program. With static library, you just need an execution file whereas with DLL you need both the execution file and the DLL file for the program to work. The following example is a normal C program with functions. We will use the above example to create a dynamic link library and an application program that use this library. We will place the DLL in a shared public folder and place the application in the personal document folder. Important: Please make sure that you save the file in program.c instead of program.c.txt. 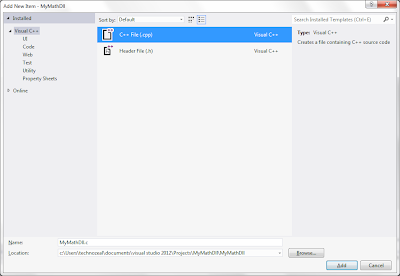 Notepad save everything in .txt extension by default. To avoid this problem, under the file explorer select Organize >> Folder and search option, select the view tab and clear the check on "Hide extensions for known file types". The dllexport and dllimport attributes are extensions to the C and C++. You can use them to export and import functions to or from a DLL. When the MYCMATHDLL_EXPORTS symbol is defined, the MYCMATHDLL_API symbol will set the __declspec(dllexport) modifier in the member function declarations. 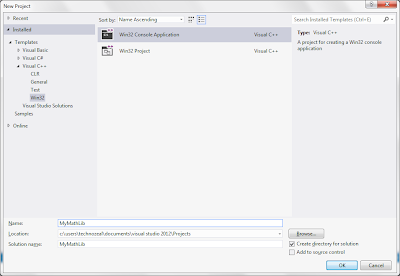 This enables the function to be exported by the DLL so that it can be used by other applications. When MYCMATHDLL_EXPORTS is undefined, MYCMATHDLL_API defines the __declspec(dllimport) modifier in the member function declarations. 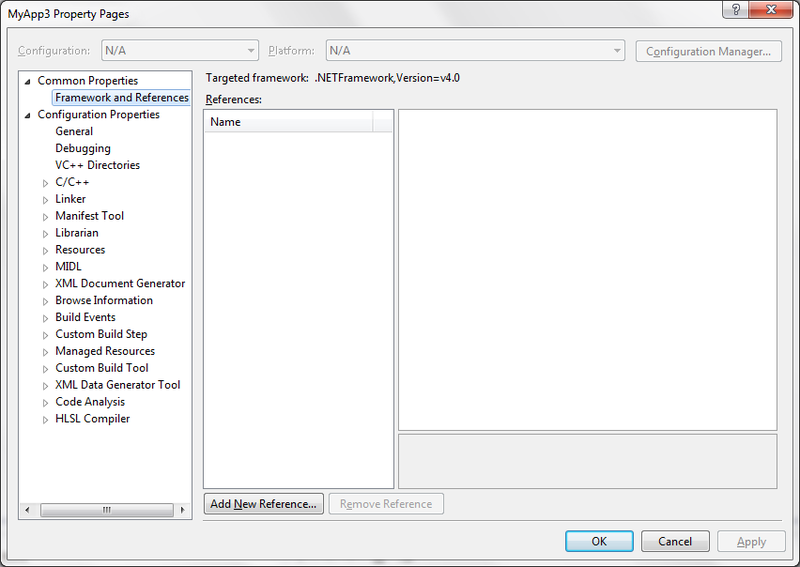 This enables the compiler to optimize the importing of the function from the DLL for use in other applications. 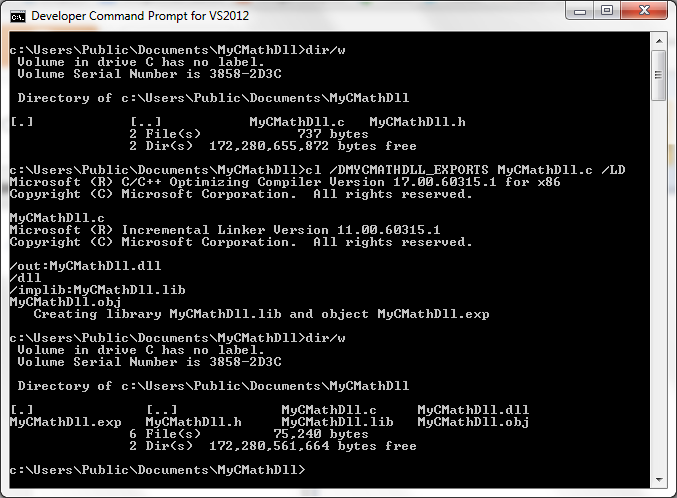 Using command line, you need to use /D option to define MYCMATHDLL_EXPORTS during compilation. You can also define the header file this way. For further information on dllexport and dllimport please refer to this article. Open a notepad and create the source code of the DLL as follows. Named the file as MyCMathDll.c. Debug any error for compilation error. 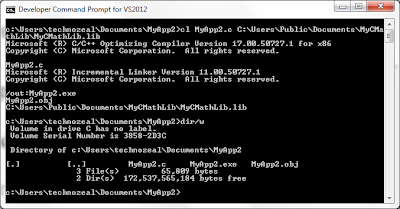 The compiler should generate an object file, an export file, a library (lib) file named MyCMathDll.lib and a DLL file named MyCMathDll.dll. 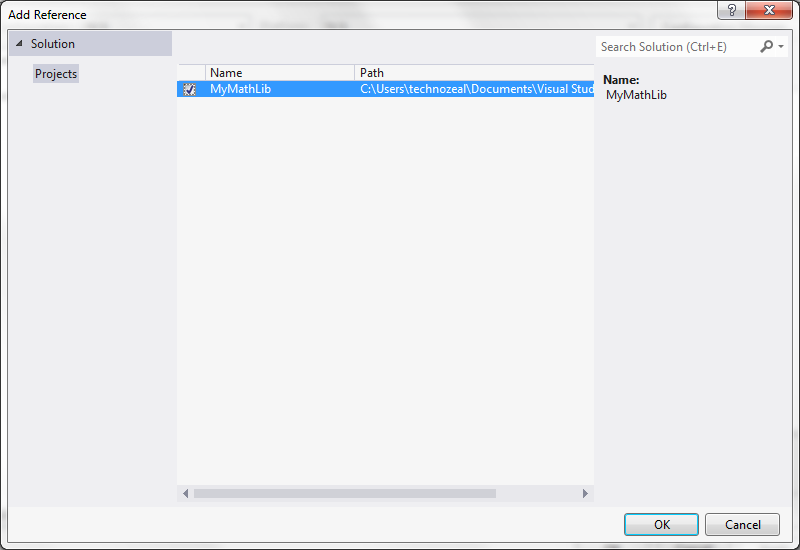 Open a notepad and create the application program making use of the functions in the DLL as listed below. Named the file as MyApp3.c. Save the file in your personal folder. Please note that you must know the location of the header file. You need to indicate the header file name and extension if the header file is in the same folder as this program. Otherwise you need to specify the full path in the program or alternatively you could specify the include path during compilation time. The latter method is much preferred because you don't need to change the program when the header file relocate. Before compilation, you must know the full path of the lib file MyCMathDll.lib. If you did not specify the full path of your header file MyCMathDll.h you need to use /I option to indicate the search path for the headers file. 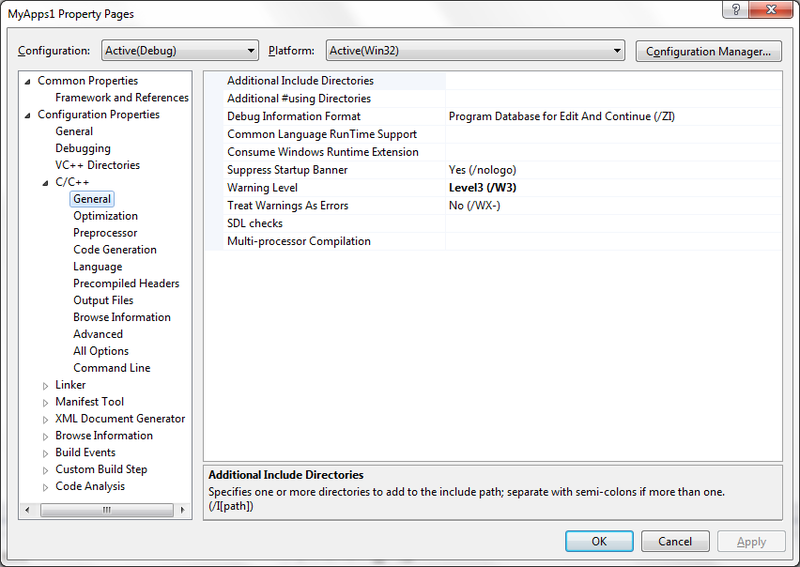 If I run my program from my personal folder, I encounter this error because the system could not locate the DLL file. The directory where the exe file is located. 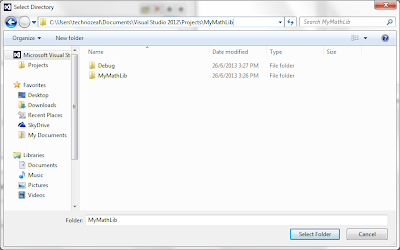 To rectify the problem above I need to copy MyCMathDll.dll to the folder containing the exe file. For C programming in other platform please refer to the C Programming page. 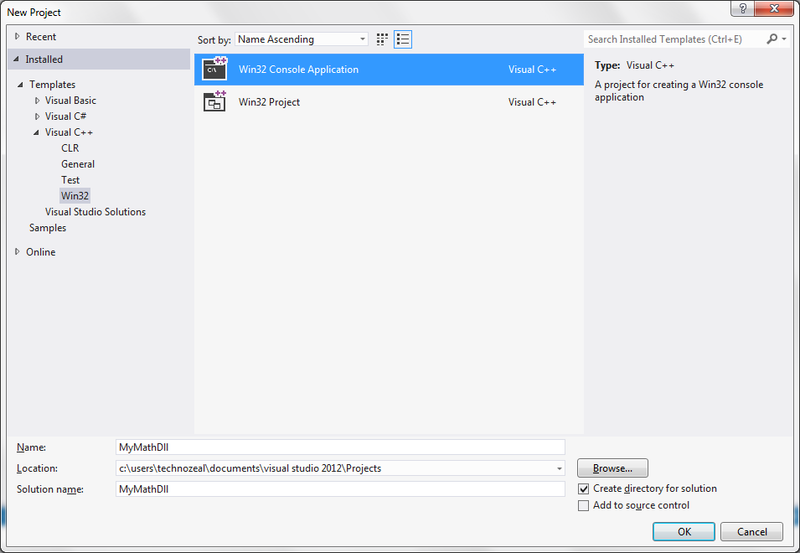 The following procedure is to create a C program with a dynamic link library using Microsoft Visual Studio Express 2012. The following example is a normal C program with functions without using any custom static library. Click "OK". Then click "Next". On following screen you need to specify that you are creating a DLL and make sure you check Empty project. Under Solution Explorer, right click Headers Files >> Add >> New Item as shown below. The dllexport and dllimport attributes are extensions to the C and C++. 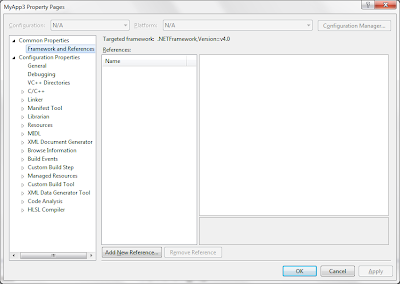 You can use them to export and import functions to or from a DLL. When the MYMATHDLL_EXPORTS symbol is defined, the MYMATHDLL_API symbol will set the __declspec(dllexport) modifier in the member function declarations. 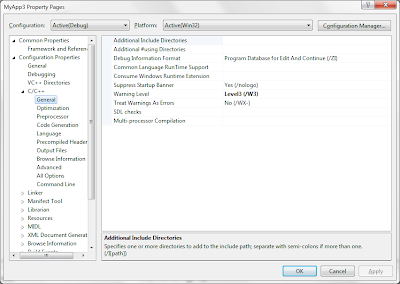 This enables the function to be exported by the DLL so that it can be used by other applications. When MYMATHDLL_EXPORTS is undefined, MYMATHDLL_API defines the __declspec(dllimport) modifier in the member function declarations. This enables the compiler to optimize the importing of the function from the DLL for use in other applications. By default, MYMATHDLL_EXPORTS is defined when the MyMathDll project is built. 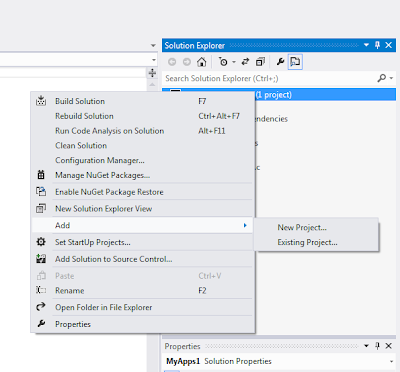 Under Solution Explorer, right click Source Files >> Add >> New Item. Rename the program to MyMathDll.c. Once the compilation is complete, close the project. 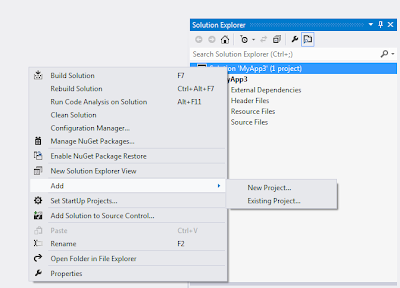 Create a new project using the name MyApp3 with Console Application as options. Remember to clear all headers and checked Empty Project. 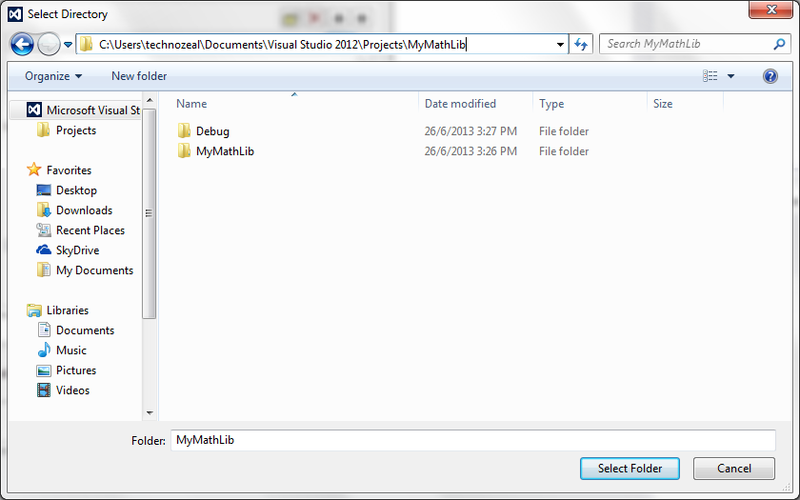 Navigate to the project folders of MyMathDll and select the project file MyMathDll.vcxproj and click Open. Select MyApp3, right click and select properties. 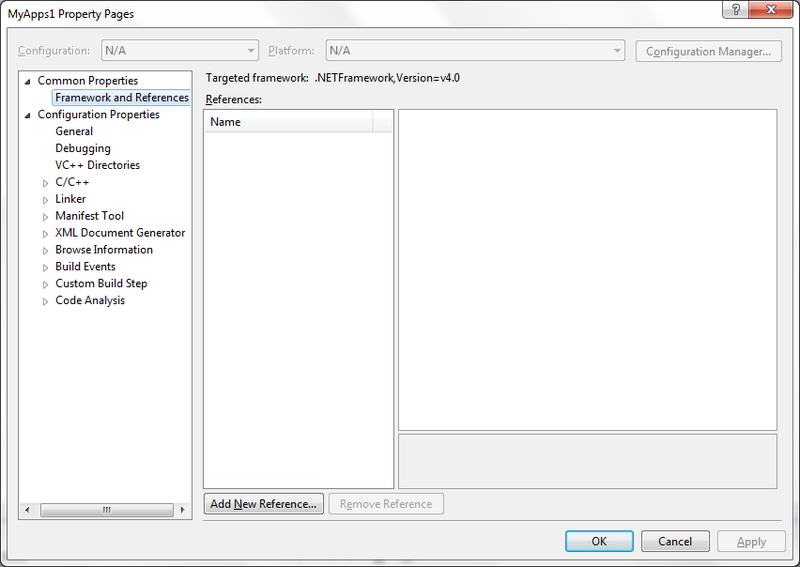 Under Common Properties, select Framework and References. Click "Add New Reference"
You should see the following screen, there should be a project named "MyMathDll". Check the project as shown below and click "OK". On the properties page, under Configuration Properties >> C/C++ expand the list in C/C++ and select "General" as shown below. Click the "New Line" icon and click on the button "...". Now you need to navigate to the DLL folder. 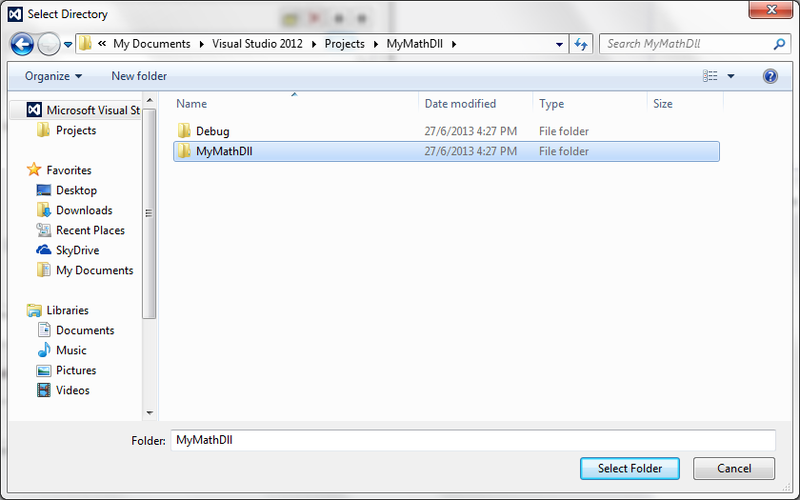 Do not select the folder "MyMathDll" under Projects, drill one level down and select the folder "MyMathDll". 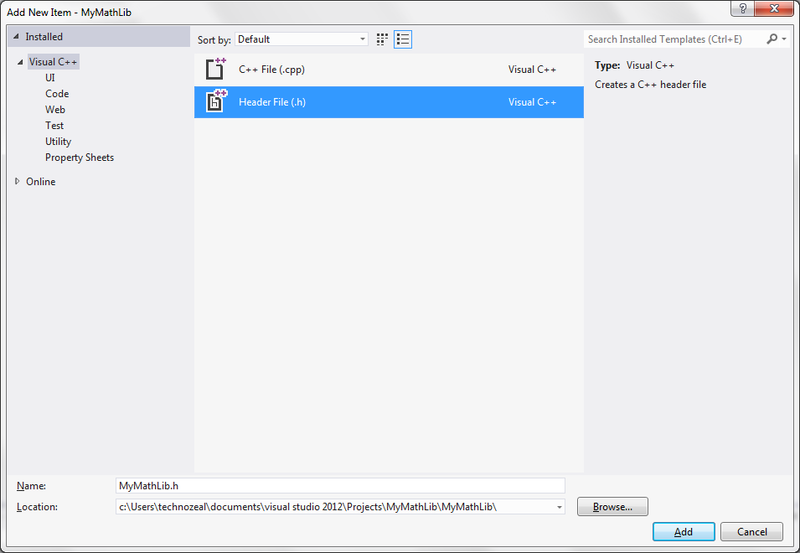 The purpose is to the select the folder that contain the header file. Highlight the folder and click Select Folder. Click OK. Then click Apply. You can close the property dialog box. 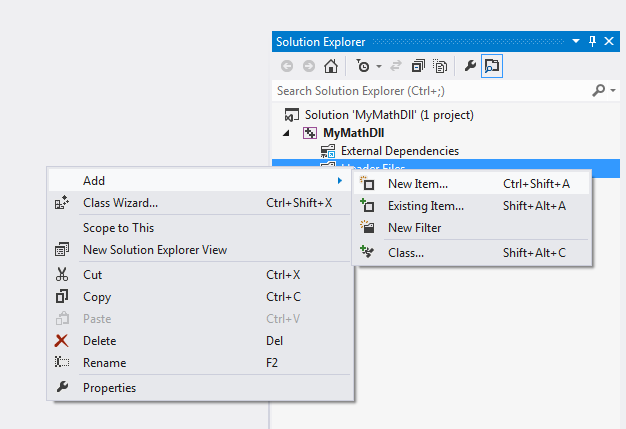 Under Solution Explorer, right click Source Files >> Add >> New Item. 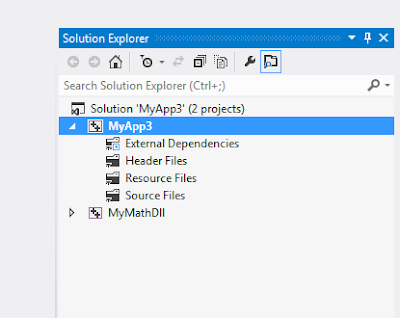 Rename the program to MyApp3.c. Step 4: Build the solution. After you have built the solutions, you should received a message similar to the one below. Please note that two projects are being built. This completes the procedure for creating a DLL in C using Visual Studio Express 2012. Please note that the procedure for creating similar DLL using command line is different from using the IDE. 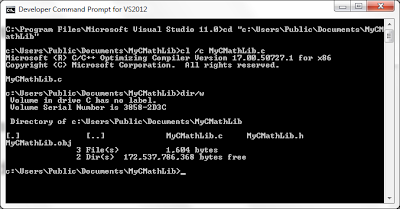 The following procedure is to create C program with static library using Microsoft Visual Studio Express 2012 command prompt. 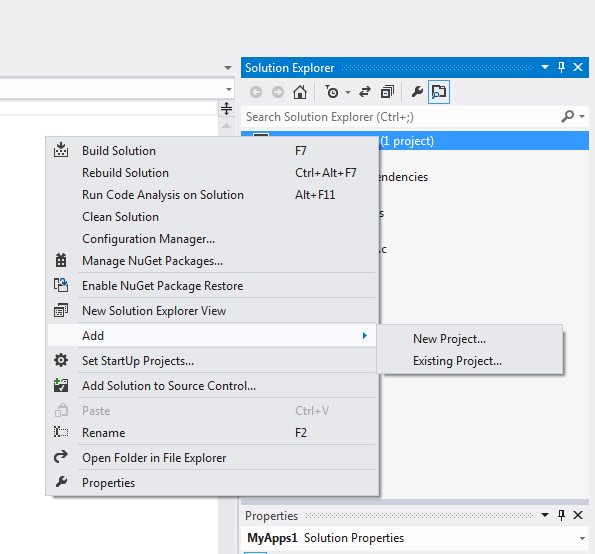 For brief introduction to software library, please refer to the previous post Create C Program with Static Library using Visual Studio. 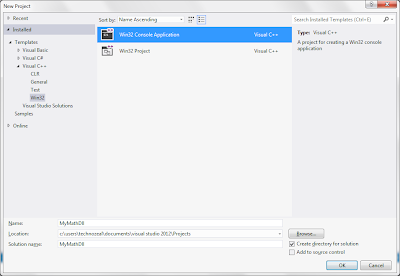 Click here for procedure of creating a C program using Visual Studio. We will use the above example to create a static library and an application program that use this library. We will place the static library in a shared public folder and place the application in the personal document folder. Open a notepad and create the source of the static library as follows. Named the file as MyCMathLib.c. 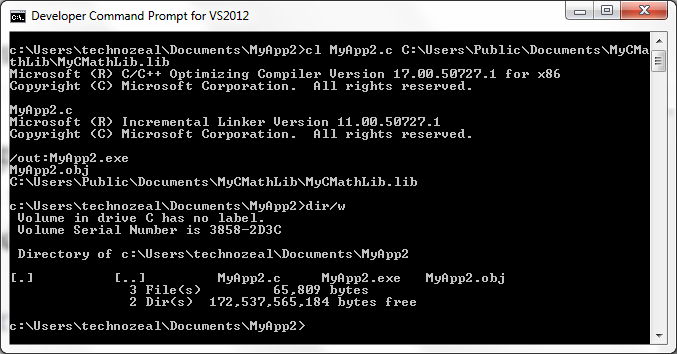 Open the "Developer Command Prompt for VS2012". 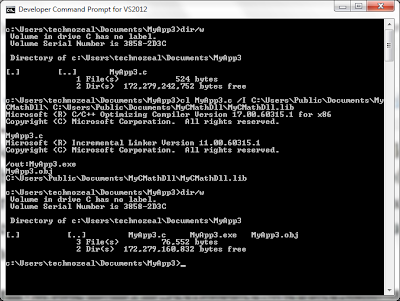 Use the following command to compile without linking the library. Next, use the following command to create the static library. 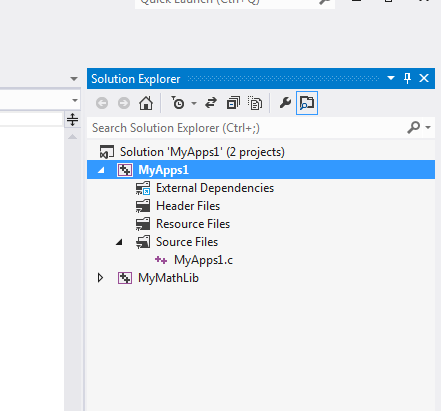 Open a notepad and create the application program making use of the functions in the static library as follows: Named the file as MyApp2.c. Save the file in your personal folder. Please note that you must know the location of the header file. 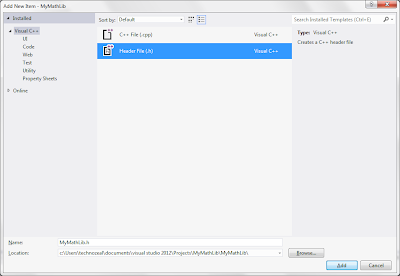 You need to indicate the header file name and extension if the header file is in the same folder as this program. Otherwise you need to specify the full path in the program or alternatively you could specify the include path during compilation time. The latter method is much preferred becasue you don't need to change the program when the header file relocates. Before compilation, you must know where the location of the static library (lib file). You need the full path for compilation. 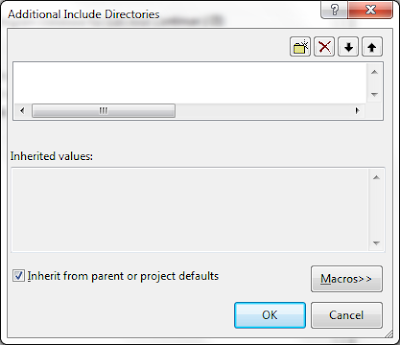 If your program do not specify the full path for the header file, then you need to use the following command with /I option to include the directory for the search path. Please note that you can place the execution file anywhere and run them because all the code in the static library is copied to the exe file while linking. 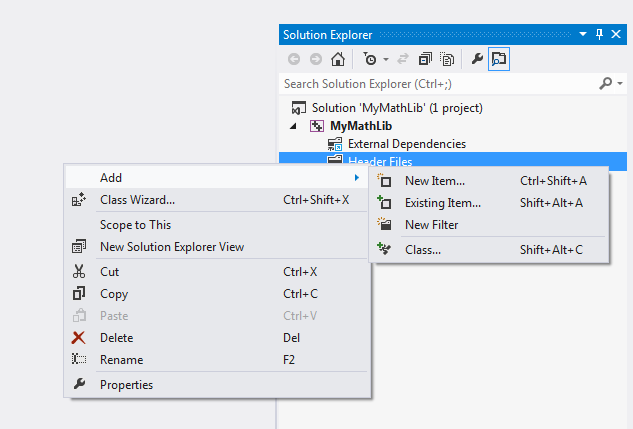 The following procedure is to write and compile C program with a static library using Microsoft Visual Studio 2012 Express edition. 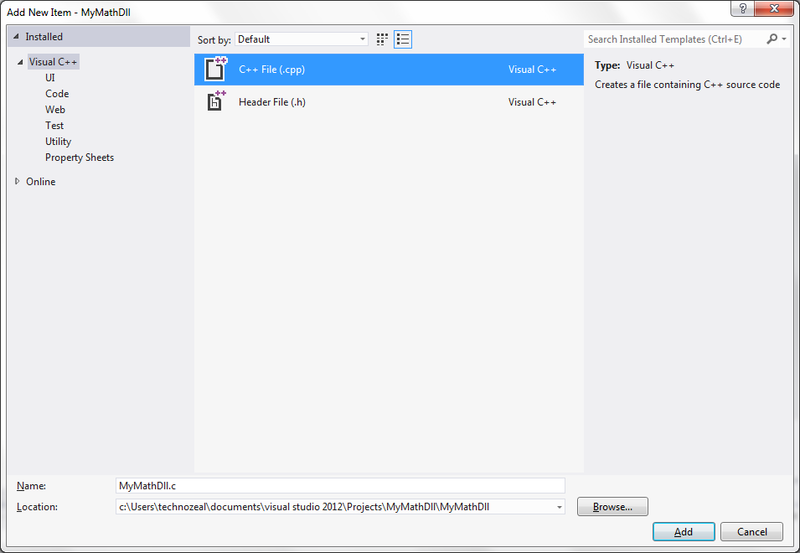 For instruction on creating a basic C program using Visual Studio, please refer to the document here. A software library is a collections of previously written functions or program which can be reused. A C program always includes a standard file called stdio.h. This file is the header file that describe all the pre-written function such as printf that comes with the compiler. This library file is also known as the system library. Library file that are created by users are called custom library. There are two types of library, static library and dynamic link library. 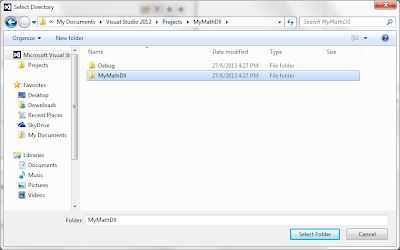 Both library files can share their codes and function with other program. A program that link with a static library will include all the program required during compilation time. After which you can ship the execution (exe) program to the user. Any changes in the static library means that you need to re-compile the program and ship to the user again. 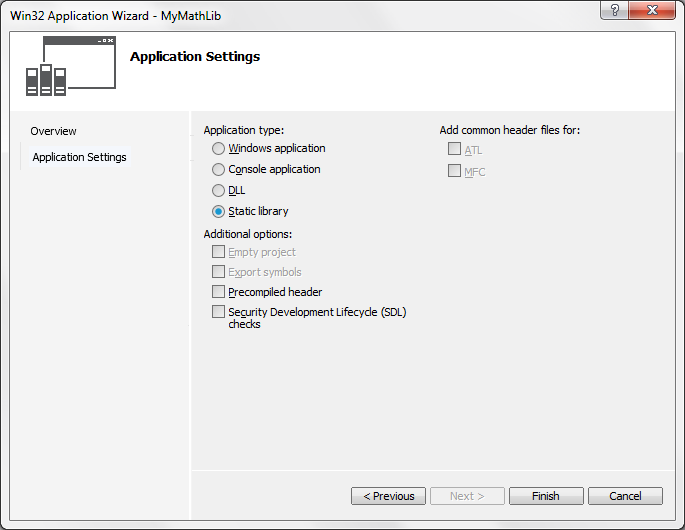 For dynamic link library (DLL) the program of external functions are not included with the applications. Both dynamic link library (DLL) file and execution file (exe) must be shipped together. If there is any changes to the library, you just need to recreate the DLL file and ship the new library file to the user without any changes to the main execution program. In this exercise, we are going to create a program that includes some math function. Compile the above program to see if it works. 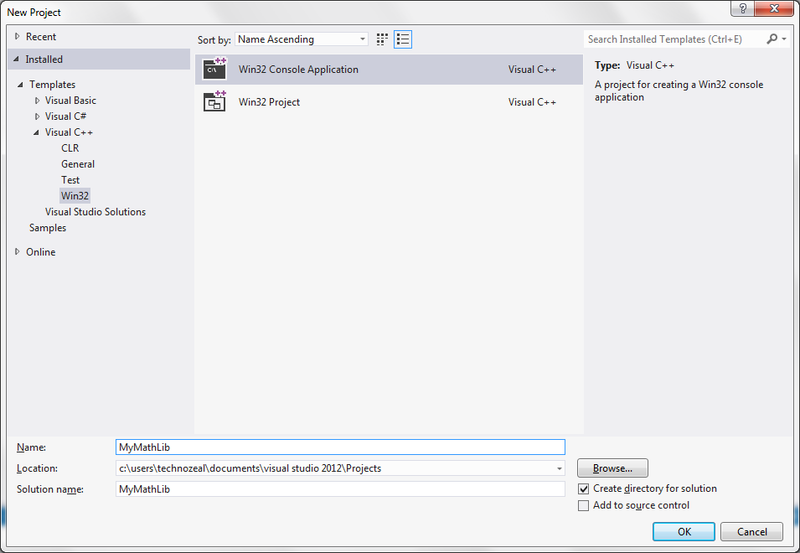 For instruction on how to create a C program using MS Visual Studio 2012 Express, please refer to the article here. To create a static library, we need to split the program into 2 parts. The main program and the static library which contain the functions. 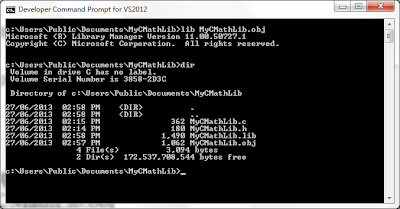 The static library will consist of 2 files MyMathLib.h and MyMathLib.c. Click "OK". Then click "Next". On following screen you need to specify that you are creating a static library. 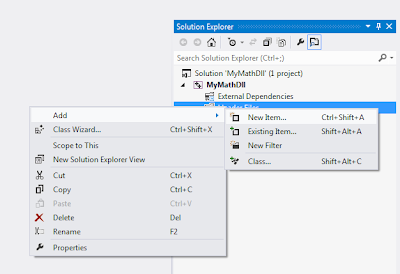 Under Solution Explorer, right click Source Files >> Add >> New Item. Rename the program to MyMathLib.c. Build solutions. Once the compilation is complete, close the project. 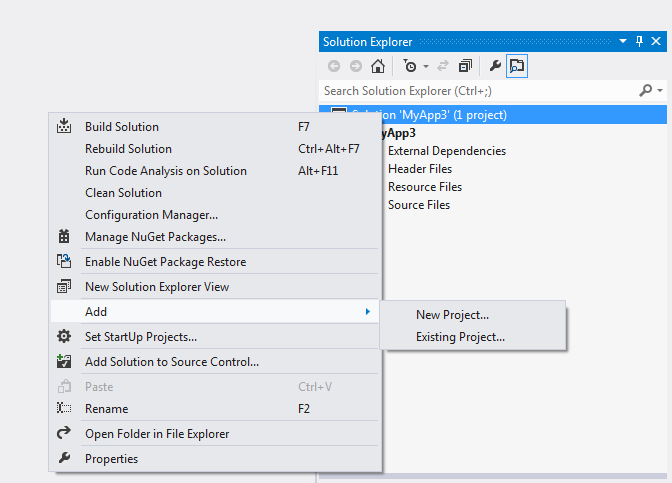 Create a new project using the name MyApps1 with Console Application as options. Remember to clear all headers and checked Empty Project. Select MyApps1, right click and select properties. 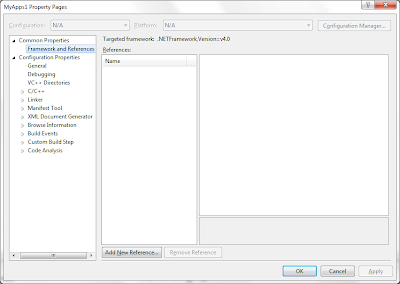 Under Common Properties, select Framework and References. Click "Add New Reference"
You should see the following screen, there should be a project named "MyMathLib". Check the project as shown below and click "OK". Click the "New Line" icon and click on the buttion "...". Now you need to navigate to the static library folder. 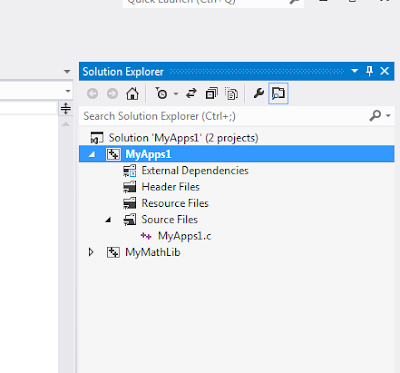 Do not select the folder "MyMathLib" under Projects, drill one level down and select the folder "MyMathLib". Highlight the folder and click select folder. Click "OK". Then click "Apply". You can close the property dialog box. 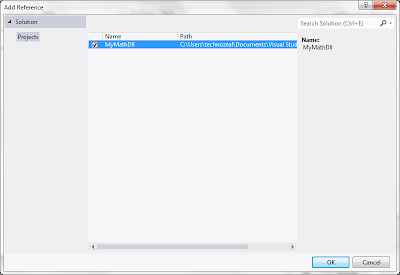 Under Solution Explorer, right click Source Files >> Add >> New Item. Rename the program to MyApps1.c. 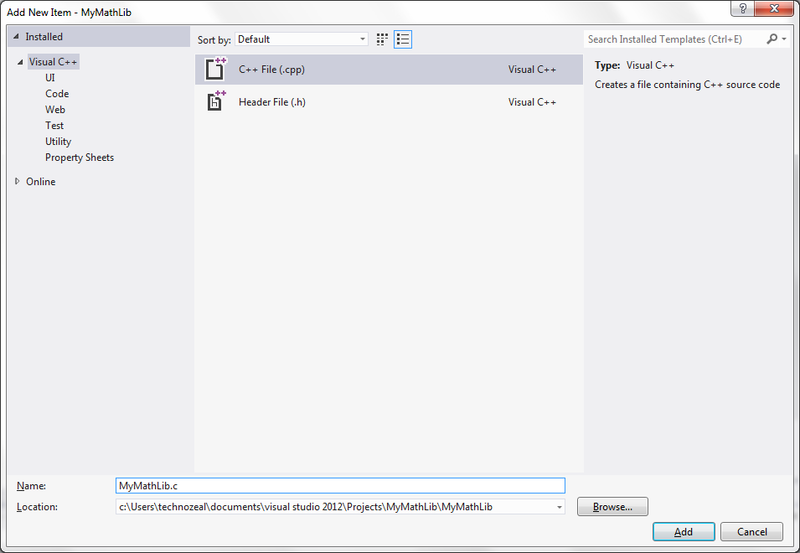 This completes the procedure for creating a static library in C using Visual Studio Express 2012. Please note that the procedure for creating similar static library using command line is different from using the IDE. You can use many tools in write C code. The most popular tool is vim and gedit. Listed below is a list of tools. The option -Wall display all possible warning (-W is for warning and all is to display all possible warnings) and -o indicate to the compiler that user want the output to be name after the -o option. The additional option -lm is required so that the compiler will search for the math library in reference to including math.h. -l is the option for library. The math library is libm.a. You can omit the prefix lib and .a.